Your own tale of two mecha. Scene: A large posh office. Bright and Amuro, well-dressed Londo Bell officers, sit facing a large table at which stands Mr. Carbine, the CEO of Anaheim Electronics. Mr. Carbine: "Well, gentlemen, we have two architectural designs for this new battleship of yours and I thought it best if the architects themselves explained the particular advantages of their designs." Mr. Carbine: "Ah! That's probably the first architect now. Come in." Bright and Amuro: "Good morning." Yazan **pointing out features on his model**: "This is a standard gravity block combining classical neo-Georgian features with the efficiency of modern techniques. The crew arrive here and are carried along the corridor on a conveyor belt in extreme comfort, past murals depicting Mediterranean scenes, towards the rotating knives. The last twenty feet of the corridor are heavily soundproofed. The blood pours down these chutes and the mangled flesh slurps into these..."
Bright: "Did you say 'knives'?" Amuro: "Do I take it that you are proposing to slaughter our pilots?" Yazan: "...Does that not fit in with your plans?" Bright: "Not really. We asked for a simple block of flats for quarters." Yazan: "Oh. I hadn't fully divined your attitude towards the crewmen. You see I mainly design slaughter houses." Yazan **Pointing at the model again**: "Mind you, this is a real beaut. None of your blood caked on the walls and flesh flying out of the windows incommoding the passers-by with this one." Yazan **In a confidential tone**: "My life has been leading up to this." Amuro: "Yes, and well done, but we wanted a battleship." Yazan: "May I ask you to reconsider." Yazan: "You wouldn't regret this. Think of the tourist trade." Bright: "I'm sorry. We want a battleship, not an abattoir." Yazan **Indignantly; Slowly gets louder and louder**: "...I see. Well, of course, this is just the sort of blinkered philistine pig-ignorance I've come to expect from you non-creative garbage. You sit there on your loathsome spotty behinds squeezing blackheads, not caring a tinker's cuss for the struggling artist. You excrement, you whining hypocritical toadies with your panoramic monitors and your hobby Hizacks and your bleeding Londo Bell secret handshakes! You wouldn't let me join, would you, you blackballing bastards!! Well I wouldn't become a Londo Bell pilot now if you went down on your lousy stinking knees and begged me!!!" Amuro **Calmly**: "We're sorry you feel that way, but we did want a simple ship, nice though the abattoir is." Yazan **Dismissively**: "Oh sod the abattoir, that's not important." Yazan **Almost pleading**: But if any of you could put in a word for me I'd love to be a pilot. The Londo Bell opens doors. I'd be very quiet, I was a bit on edge just now but if I were a pilot I'd fly at the back and not get in anyone's way. Yazan: "...I've got a second-hand helmet." Yazan **Hopefully**: "I nearly got in at Dakar." Mr. Carbine: "I'm sorry about that. Now the second architect is Mr. Scirocco of Scirocco and Morses." Paptimus **Launching into his spiel**: "Good morning gentlemen. This is a scale model of the ship, 480 meters long, with 8 mobile suit compartments. It has three main lifts and two launch catapults. Access would be from the combat bridge." Paptimus **Continuing**: "The structure is built on a central pillar system with..."
Paptimus: "...with cantilevered floors in pre-stressed titanium and concrete. The dividing walls on each floor section are fixed by recessed magnalium-flanged grooves." Paptimus: "By avoiding wood and timber derivatives and all other inflammables we have almost totally removed the risk of...."
Paptimus: "Frankly, I think the engine mounts may need strengthening." Amuro: "Is that going to put the cost up?" Amuro: "I don't know we need to worry too much about strengthening that. After all, this isnâ€™t meant to be a luxury ship." Bright: "Absolutely. If we make sure the crew are of light build and relatively sedentary and if the weather's on our side, I think we have a winner here." Paptimus: "Well, thank you both very much." Yazan **Breaking the 4th Wall**: "It opens doors, I'm telling you." Hey! why don't you swing on down to the RPG section? Tales from the Frontlines: The AEUG running strong since 2006! I realise that by saying what I am about to say I may be excommunicated from the mod cricles, but I have never seen any Monty Python material in my life. Anything I know about is only what I have read or seen online. Sorry Fritz, this work here goes right over my head, but is still interesting as far as how one might go about chooseing various designs for a new warship, in this case the Ra Callum. Direct adaptations have never been my bag of tea, but I commend you for not falling into the trap of using the ZOINKS Holy Grail as your material, instead opting for the much superior Flying Circus. Pretty well adapted, but it's really not my kinda thing. Make sure to check out the RPG section! Speaking of the "**** Holy Grail", too bad we don't see Enigma around much any more. I expected this piece to appeal to the Python fans, so I'm basically waiting on Red (and I think it was Ascension?). But at least the few of us can laugh together about stupid things like this like it's a secret club or something. EDIT: I guess that's a "How to Spot a Jovian" picture. Wingnut, you're not the only one who hasnt seen much of Monty Python's work. Like you, I've only read about some of his stuff. Anyways, I enjoyed this Fritz. Yazan should have been a bit more brutal to be more "in-character" (think New Adventures of Tomino-sama brutal...), but overall a good read. ShadowCell wrote: "Poor fool, ShadowCell!" you say. "You can't win against fandom stupidity with the Power of the Mod!" Good stuff, Fritzy. Good stuff. Anyway, someone get the Holy Hand Grenade, for we must punish the Wingnut for his lack of knowledge (It would have been funnier if it was Heretic saying that, as we could then call him a heretic and have all sorts of fun!). Fritzy wrote: EDIT: I guess that's a "How to Spot a Jovian" picture. For whatever odd reason, it made me think of both the Kinghts Who Say Ni and 'How Not To Be Seen'. EZero8 wrote: Wingnut, you're not the only one who hasnt seen much of Monty Python's work. Like you, I've only read about some of his stuff. Shall I point out Monty Python isn't a single person but rather a group of men? mcred23 wrote: Shall I point out Monty Python isn't a single person but rather a group of men? I thought about quoting him and saying "That alone proves he's not lying,", but I didn't. Someone really should combine Gundam and "How not to be seen"
mcred23 wrote: Anyway, someone get the Holy Hand Grenade, for we must punish the Wingnut for his lack of knowledge (It would have been funnier if it was Heretic saying that, as we could then call him a heretic and have all sorts of fun!). 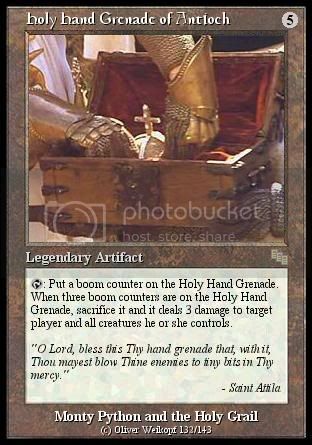 Here's the Holy Hand Grenade. REGENE: (Grins) Any last words, Buuuuur-ing? REGENE: (Shakes head) Right then. Forgot we don’t talk on Planet You. Well, I did toss in a few "How Not To Be Seen" comments in back in one of the old Random Image Thread's, with pictures of MS standing up in wide open spaces. Plus, I think Fritzy had reworded the entire Holy Hand Grenade scene, with me as King Arthur. It was a toss-up between what I was going to do next. The Dead Haro sketch or How Not To Be Seen. I guess "How Not To Be Seen" is COMING SOON. Narrator (Char): "In this picture there are forty people. None of them can be seen. In this film we hope to show you how not to be seen." Char: "In this film we hope to show how not to be seen. This is Mr. G. Zabi of Napier Court, Black Lion Road, Zum City. He can not be seen. Now I am going to ask him to stand up. Mr. Zabi will you stand up please." Char: "This demonstrates the value of not being seen." Char: "In this picture we cannot see Mrs. K Zabi of 13, The Crescent, Granada. Mrs. Zabi will you stand up please." Char: "This is Mr. Zabi of Harlow, Core 3. Mr. Zabi would you stand up please. **nothing happens** Mr. Zabi has learnt the value of not being seen. However he has chosen a very obvious piece of cover." Char: "Mr. D Zabi of Homeleigh, The Burrows, Tigerbaum, has presented us with a poser. We do not know which bush he is behind, but we can soon find out. **the left-hand bush explodes, then the right-hand bush explodes, and then the middle bush explodes. There is a muffled scream as Dozle is blown up** Yes it was the middle one." Char: "Mr D.S. Zabi, of Leighton Road, Zum City has concealed himself extremely well. He could be almost anywhere. He could be behind the wall, inside the water barrel, beneath a pile of leaves, up in the tree, squatting down behind the car, concealed in a hollow, or crouched behind any one of a hundred bushes. However we happen to know he's in the water barrel." Char: "Mr. and Mrs. Ray of Ivy Cottage, Worplesdon Road, Londenion, chose a very cunning way of not being seen. When we called at their house, we found that they had gone away on two weeks holiday. They had not left any forwarding address, and they had bolted and barred the house to prevent us from getting in. However a neighbor told us where they were." Nonetheless, it was very entertaining. Blowing everything up must be a hobby of yours. Well, I couldn't look at all the pictures right now (png takes longer to load...) but I still laughed. The titled card made me fall out of my chair (again) as I thought about Zeon Paratroopers. Well we have Kill-them-all Tomino and Flashback-them-all Fukuda. Er mind being Blowup-them-all Fritz? HE IS NOT A CHAR! Did someone say Ascension was a Monty Python fan? Someone was right! Yay! However, someone did not realize that Ascension doesn't ordinarily read the Fanfiction section, thus leading to an incredibly long delay between this being posted and the aforementioned Mr. Ascension finding it. That being said, I have reason to believe that Ascension has now read said parody, and quite enjoyed it. I have yet to confirm this story, but several eyewitness accounts state that laughter was involved. ...in fact, it's best if you forget I was ever here before. Von August: Hey, what are you guys looking at? Officers: **they answer in unison without looking at Von August** Dopps. VA: What kind of Dopps? VA: Can you talk to the Dopps? Officer 1: **on radio** New pickup, Great Canyon. VA: Can the Dopps talk back? Garma Zabiâ€™s voice: **over radio** Great Canyon, roger that. VA: **curious** Do it again. Officer 1: No, the Dopps have work to do. We donâ€™t agitate the Dopps. Officer 2: **turns and looks sternly at Von August** We donâ€™t agitate the Dopps. Norris Packard: **appears in doorway eating cake** Whoâ€™s agitating my Dopps? ** he looks at Von August and takes a bite of cake** You agitating my Dopps? Announcer: Hervic fighter/bomber planes with GPS tracker. Get things done instantly. Available at Zeonic or Hervic retailers. The Dopp, from Hervic. EDIT: For whoever doesn't get it. WATCH MORE TELEVISION! Nice. Any more commercials that you can Gundam-ize? Cwazy and funny as always Fritzy, although the tech-crazy person in me kept going "Did Hervic build the Dopp?". mcred23 wrote: Cwazy and funny as always Fritzy, although the tech-crazy person in me kept going "Did Hervic build the Dopp?". Actually, no they didn't. Hervic built the more modern fighters for the Federation such as the FF-X7 Core Fighter, FF-S3 Saberfish, and the FF-6 TIN Cod. We don't know what company actually built the Dopp.